Open your world to fine art classes. Where paint, pen, charcoal, your hands, or sculpting knives become the ways you express something deep inside you that has wanted to show itself. Feel the freedom and the confidence of creating something from nothing. Of showing who you are through art. Everyone is an artist and every life is made better by allowing your artist to emerge. Art Alliance classes are held on schedule when the Greensboro Cultural Center is open.The Greensboro Cultural Center is closed on Federal Holidays. Art classes meet in room 127 of the Greensboro Cultural Center weekly for 7 or 8 weeks per session. There are 6 sessions per year. Class size is limited to 8 to 10 students and pre-registration is required. Payment is due by the first class. Click on the link to register or the Register tab above. an encouragement to gain knowledge of human anatomy to aid in understanding the forms of the human body and it’s consequent depiction. See our Monday Drawing Class for a great foundation class. Suitable for beginners and intermediate students, this class is for the person who wants to learn and expand upon basic drawing techniques using pencil, pen, and ink. This class will explore the basics of oil painting with an emphasis on individual expression. Working from still life and photographs, students will explore materials and techniques to develop their skill with oil painting and develop an understanding of composition and color theory. Highly suggested–previous drawing experience is recommended. See our Monday Drawing Class for a great foundation class. This class will explore the basics of oil painting with an emphasis on individual expression. Working from still life, the student will develop the rudiments of oil painting, basic drawing techniques, color theory, and composition in order to create a finished painting. 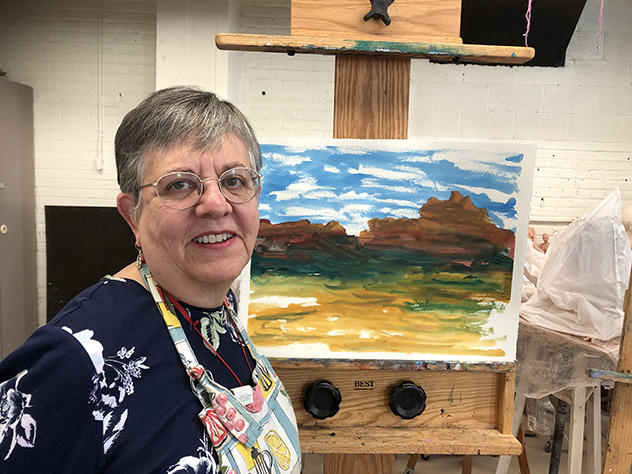 This class is for artists with some experience who want to focus on developing a greater understanding of color theory and composition through the medium of oil paint. Students will learn more about how color is created and used compositionally as well as more advanced techniques to create a unique painting using their photographs, still life objects or their own imagination. A comprehensive class exploring the fundamentals of painting portraits in oil while reviewing the principals that underlie all good art. In this class, students sculpt in clay from a live model, creating both portrait and figurative sculptures. Experience not required, but enthusiasm is essential. Class size is limited to 9 students and preregistration is required at least two days prior to the start of class. Please call 336-373-2725 or email artalliancegso@gmail.com for more information.